The fact that it is in the airport is a great thing. This could be the cleanest hotel I’ve ever been in. The rooms are very spacious and well appointed. But the best part is the service and food available on the executive level. Really fantastic! Overall good experience. However, one important point would to mention that the hotel food menu lacks variety especially for Vegetarians. Very quiet and peaceful. Staff was very professional and customer oriented. Bed was very comfortable and the free Wi-Fi was fast. I purchased the $60 upgrade to the executive suite and it was SO worth it. I sat in that massage chair for hours (definitely needed after my long flights). The selection included in the all-inclusive food and alcohol menu in the executive lounge was basic but enough and also made the upgrade more than worth it. Most convenient hotel - I had a 7 hour layover and was able to shower and sleep without leaving airport. This was only ~2 min walk from my gate. Great hotel with professional staff! Perfect option for a traveler going through Dubai with a long layover..
Great location and very easy since it's in the terminal. The room is stark, but very clean and efficient. The hotel staff met us as we came off the plane. The airport is complex so it was very appreciated. The room was quiet and luxurious with free WiFi. Then a fantastic breakfast with lattes included to send us off. We purchased the executive upgrade and highly recommend it. The hotel was comfortable but 5 star is a stretch. Very convenient for long layovers. Hotel staff at front desk was totally unhelpful! We asked about restaurants and were given a seemingly canned response (like the telemarketers that sound like a broken recording) about the hotel restaurant. I don't know if they were instructed to only direct people to the hotel restaurant but at a 5 star hotel, I expect the staff to at least try to be helpful. The concierge was somewhat more helpful and gave vague (and incorrect) directions when we gave him the name of a restaurant we were looking for. Dissappointing! Good luck finding it. We couldn't find the promised guide who was supposed to meet us at the gate, and there are no signs in the airport and their maps are worthless. Basically, find an elevator near the gates indicated in your reservation and get in it. WARNING - The hotel is inside security. If you have to collect bags, or if you're not arriving at the airport by airplane, you will be outside security and they won't let you through until 4 hours before your flight. Also, security won't let you enter a terminal unless you have a flight departing that terminal, so be careful which terminal/concourse you book. If I understand right, Concourse A = Terminal 1, and Concourse B & C = Terminal 3. Concourse D = ?? and Terminal 2 has no Concourses. Welcome to the UAE. It takes an hour to get between any two terminals. See the "Critical" reviews for further details. This hotel is located within the security bubble of Dubai airport. It is a perfect solution if you have a long layover at DXB, because you can avoid luggage pick-up, immigration & customs lines. Nor do you have to be at the airport three hours early, because you're already there. The room was spacious, clean and comfortable. My only complaint was the lack of a reading light and chair. My window overlooked an airport concourse, which was rather weird, but you are in the middle of an airport. This hotel is great if you arrive on Emirates. The hotel is in the terminal where all the Emirates flights come in. If you arrive on any other airline (mine was Lusthansa), you have to walk about 1 mile through the terminal, go through another screening, take a bust to the other terminal and then go through security again. Too much brain damage after a long flight. Just find a hotel near the airport with a good shuttle and you will be much better off. I have done this hotel twice now, thinking I did something wrong, I tried it a second time. Nice hotel, but too much brain damage. Good staff; ordered continental breakfast but came without cereal as none was available! - definitely not a 5 star hotel. Makes for an easy stop when connecting in Dubai - no having to worry about finding where hotel connections are, how long to wait for the net hotel shuttle, etc. also makes for an easy morning the next day, just ride he elevator two floors down to the terminal. Worth the price for those benefits right there. 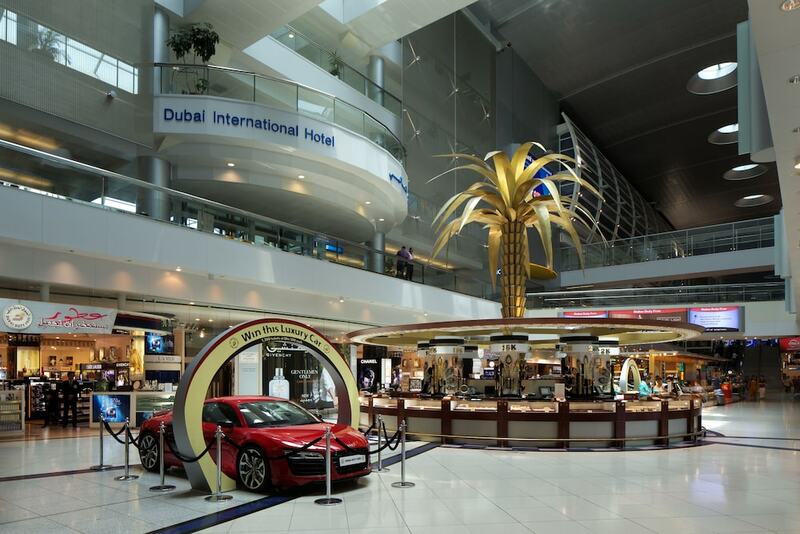 Located 2.4 mi (3.8 km) from City Centre Deira, Dubai International Airport Terminal Hotel is within a 15-minute drive of other popular attractions like Dubai World Trade Centre. This 530-room, 5-star hotel has 2 indoor pools along with a full-service spa and 9 restaurants. This hotel is home to 9 onsite restaurants, perfect for a quick bite to eat. Savor a meal from the comfort of your room with 24-hour room service, or entertain your taste buds with a beverage at the bar/lounge or 4 coffee shops/cafés. Buffet breakfast is offered for a fee each morning from 6 AM to 10 AM. A 32-inch LCD TV comes with cable channels, and guests can stay connected with free WiFi and wired Internet. The bathroom offers hair dryers, free toiletries, bidets, and slippers. Other standard amenities include a sitting area, a minibar, and a coffee maker. Guests of Dubai International Airport Terminal Hotel have access to a full-service spa, 2 indoor pools, and a 24-hour health club. The 24-hour front desk has multilingual staff ready to help with concierge services, and answer any questions about the area. Other amenities at this luxury hotel include a spa tub, a sauna, and free WiFi in public areas. The hotel has 2 indoor swimming pools and a spa tub. A 24-hour health club and a sauna are other recreation options. Guests should contact the hotel in advance with their flight details so that staff can assist them in arriving at the hotel. Contact details can be found on the booking confirmation. Guests must provide their boarding pass and passport at check-in as this hotel is inside the airport. For more details, please contact the property using the information on the reservation confirmation received after booking.